Tuesday, 19 March 2019, 10:24a.m. 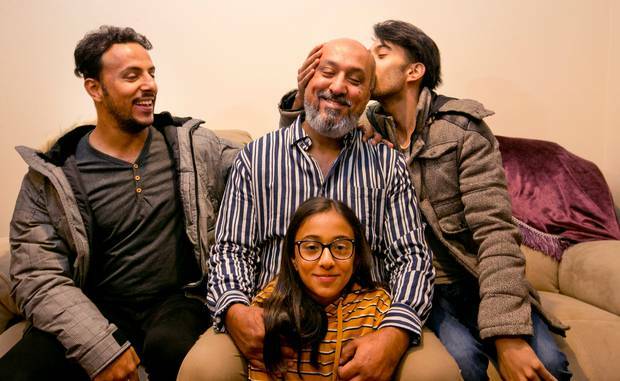 Khaled Al-Jammali gets a kiss from his son, Mahmoud Al-Jammali, right, while his other son, Hamoud Al-Jammali, left, and daughter Tala Al-Jammali are just happy to be with their father. Khaled Al-Jammali came face to face with the killer in the Masjid Al Noor on Friday. The gunman raised his weapon and pointed it at Al-Jammali, who thought to himself: this is the end. But then, for reasons unknown to Al-Jammali, the gunman didn't fire. Instead he swivelled and shot the person beside him, and then turned away and opened fire in a different direction. "I don't know why he didn't shoot me. He shot the guy beside me and killed him, and then turned to the other side to kill my other friends in the other corner," Al-Jammali told the Herald. "I was one of the luckiest persons ... God just saved me from the bullets and his machine gun." Al-Jammali was a regular visitor to Masjid Al Noor. Every Friday, because of a leg injury, he took a seat near the window to pray. When the serenity of prayer time was interrupted by gunfire, he became confused. "I never imagined that this is guns because we are in a safe, great country, a very safe country. Normally I can't imagine that this would happen. No way. "I realised the truth when he came in front of me and start killing the people. I realised ... I'm going to be dead." After Al-Jammali had been spared, he jumped out of the window. He cut his knee on broken glass in the process - and was then trampled by the rush of people that crashed over him like a wave. "Everyone was just so scared... many people trying to get out, it was very hard. At the same time, we could hear the shots being fired." Al-Jammali pulled himself up and joined the others running for their lives through the backyard and then jumping the fence to the neighbouring property. He found a spot to lie down and hide, only allowing himself to stand up and survey what had happened after police arrived and secured the scene. "I saw two or three kids killed, a small girl killed on the street. There were a lot of bodies at the mosque while they were starting to move the injured people. "He killed innocent victims, my friends, kids and children, just killed them in cold blood." As Al-Jammali had only suffered minor injuries to his knee and his back, he was one of the last people to be taken to hospital. 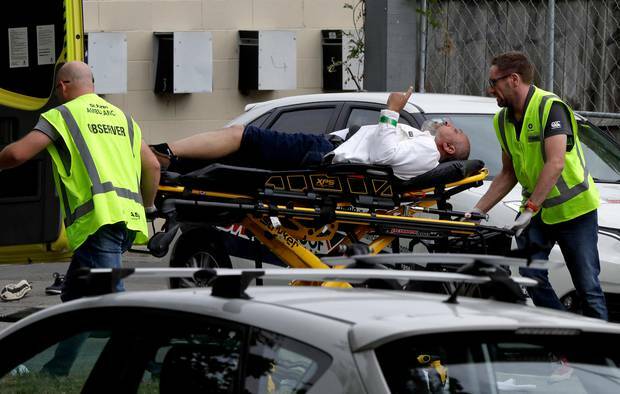 An iconic photo of him on a stretcher arriving at Christchurch Hospital - pointing a finger at the sky - has been published in the Herald and around the world, but Al-Jammali has no memory of that moment. "I was shocked, very shocked, so I can't really remember." Around the same time, his 21-year-old son Mahmoud was distraught trying to find his father. Mahmoud was late to Friday prayers that day, and by the time he arrived, the gunman had already left a trail of dead bodies. "I saw the dead people in front. I didn't believe it. No way," Mahmoud said. "If I see dead people like that, I felt like my Dad might be one of them. I went crazy. The police tried to calm me down ... [but] I didn't find him. "I waited one hour outside, looking everywhere. And one of my mates came up to me said, 'Your dad is alive but got shot in the leg.' So that got me crazy more and more." A photograph of Khaled Al-Jammali being stretchered into hospital on Friday went around the world. Mahmoud went to the hospital but couldn't get in because of tight security. He was desperate and started pleading with police: "Please, my dad got shot. I can't wait here." When police eventually let him inside, the chaotic scenes made it impossible to find information about his father. But he found comfort in other friends that were also waiting anxiously for news of their fathers, who had also suffered gunshot wounds. "I was so shocked and so scared I was going to lose him." When Mahmoud was finally reunited with his father, he ran up to him with the words: "Thank God you're still here." Al-Jammali and his family have been overwhelmed at the response in the city and around the country, having seen the endless flow of flowers and poignant words at the city's memorial sites. They have no intention of leaving the city, and want to return to Masjid Al Noor. "We are going to go back. Nothing is going to stop us from doing our religion," Al-Jammali said. "I will never leave New Zealand. This is my home. This is my country now after all these years ... New Zealand is the best country. The people are very friendly. Most of our neighbours came and visited me and offered me all the support that I need or want." Al-Jammali grew up in Kuwait and moved to Auckland with his family in 1996. He returned to Kuwait for work as a sales manager, but found a home in Christchurch four years ago. He was welcomed into the city's Muslim community, and knew many of the deceased well. "The people killed or shot, they are my best of friends ... What shall we do? It is part of the life. We have to carry on." One of those who died was Moshin Al-Harbi, who Al-Jammali describes as his best friend. Al-Jammali started receiving confused phone calls yesterday when global media reported on Al-Harbi's death, but in stories that showed the iconic photo of Al-Jammali pointing to the sky. Al-Jammali reassured those calling him that he was actually still alive, and very lucky to be so. He and his family realise that others in the tight-knit community have not been so lucky, and they are focused on supporting those families. They have been at the hospital everyday since the attack. Al-Jammali said the silver lining to this horrific ordeal was that the whole world can now see that Muslim people are peaceful, loving and welcoming. "Even when he came to start shooting innocent people, the first he killed told him, 'Welcome, brother'. "Now all of the world knows that Muslims are very friendly, even when there is someone trying to kill them. "This is what we are. This is our religion. I hope he can understand this too."